Welcome back, Legends fans! This week, our heroes managed to avoid prolonging the Cold War, so that’s certainly something. Good work all around, especially considering a few rogue elements (I’m looking at YOU, Young Dr. Stein) who seemed to bend over backwards to try and bring about nuclear war. We also finally started getting some insight into the mysterious and clandestine motivations behind the Legion of Doom, which is both exciting and terrifying. So far, we know that Thawne is the driving force behind the Legion’s formation and plans, and whatever those plans may be, they apparently blow Darhk’s scheme (you know, the one we saw over on Arrow) out of the water. Yikes. Also, interesting to note that while Thawne’s plans might not include the need for “trinkets” like Darhk’s did, it still seems to need the aid of a specific set of mystical artifacts. So far, we have the ambiguously defined “Askaran Amulet” and now an even more mysterious item in a small box. Did anyone else think it looked like the sort of box you’d keep a ring in? It definitely looked like a ring box to me. We’re still short members of the Legion as well, so while the pieces are being placed on the table there are still some vital ones missing, and I feel like whether or not Thawne’s scheme has anything to do with the warning from Future Barry is still pretty up in the air. After all, how would an all out war (likely brought on by the Dominators invading the planet) really benefit Thawne? Could it? I mean, probably, right? We’re dealing with super villains here and they seem to be able to benefit from everything. There’s just too much we don’t know yet, but I for one am anxiously awaiting the full-fledged Legion reveal. Emphasis on “anxiously.” I’m kind of a mess about it. Which, speaking of being kind of a mess, this week we had front row seats to not one but two pretty hilarious messes in young Stein and Ray, both of whom were trying very desperately to step into roles that were...well, not very suited to them, I guess is the best way to phrase that gingerly. While Ray tried to tap into his “coolness” to become the new Snart—something which, face it, cannot be done (sorry Ray)—young Stein tried to set his jaw and gun for a promotion at the worst possible time. Both had predictably poor trajectories that were just barely circumvented by some help from their friends (or, you know, future selves). Phew. I spoke a bit last week about how a major theme of this season seems to be confronting fears, and while last week’s episode dealt with that in a majorly external way (you know, with the zombies, and the explosions), this week’s episode dug into the more internalized aspects of that idea. Sometimes (most of the time, honestly) the things we’re most afraid of aren’t running at us and gnashing their teeth, they’re hiding just behind our eyes. And it’s those fears, the kind that lurk just out of sight, that can drive us to do the craziest, stupidest, silliest or most dangerous things. You know, things like Ray nearly getting himself and Mick taken out by the secret service in a desperate bid to prove that he could be more like Snart. Or young Stein nearly getting killed by Darhk, which would have made our present day Stein’s life really, really difficult. But hey, at least Mick and Ray got some famous jellybeans out of their near miss, right? That has to count for something. Anyway, what I’m saying probably won’t come as news to anyone, but our Legends are flawed. Like, really flawed, and grappling with a lot of pretty intense anxieties. I’m honestly never sure if they’re going to be able to pull through and make the right decision, or if there even is a right decision. But I think that’s really what makes me love them so much at the end of the day. They may just be Time Janitors, but hey, they’re our Time Janitors, right? Another neat aspect of this week’s episode I’d be totally remiss to not point out: The return of Todd Rice, aka Obsidian! I gave a little blurb about just who Obsidian is when the JSA first arrived back a few weeks ago, but we actually got a pretty good look at just who he is and what he does this week. And speaking as a pretty big Obsidian fan, I was both surprised and totally elated. We got a much better look at Todd’s shadow powers and some insight into his personal identity as well. In the comics, Todd’s history is rife with manipulation, mental illness, and crisis that later shook out into an open acceptance of his queer sexuality in the early 2000s. It wasn’t a clean or an easy process for him, but then again self-discovery rarely is. By the sound of it, things for this #DCTV incarnation of Todd were similarly challenging. After all, he states plainly it was concern over his sexuality that prevented him from going on the mission that got the rest of his team killed. Ouch. In a show like Legends where the concept of time is fluid at best, that old adage about it “healing all wounds” doesn’t really hold true, but I’m glad to see Todd was able to find himself some peace, and even make amends with Amaya. I really hope we get to see him, and the rest of the JSA, again soon. And finally, did you catch this week’s #DCTV Secret? It was kind of a two-for-one deal this time around. If you were paying close attention to the news broadcast about the debacle at the White House, you could have caught the name and the format of the program: “52 Action News.” Now, obviously the number 52 has some pretty huge significance in the DCU at large, but beyond that, “Channel 52 News” actually existed in the comics for a while as well! During the New 52 reboot, continuity across books was maintained and discussed as back matter for several issues by a pair of news anchors delivering messages directly to readers about the events in multiple books. Gotta stay informed! Did you spot any other #DCTV Secrets this week? Do you have a burning theory about the Legion’s schemes? Do you think Ray ever be able to stop embarrassing Mick? Let me know in the comments! Meg Downey covers DC's Legends of Tomorrow as a part of the #DCTV Couch Club. Look for Meg on Twitter at @rustypolished. DC's Legends of Tomorrow airs Thursdays at 8 p.m. (7 p.m. CST) on The CW. 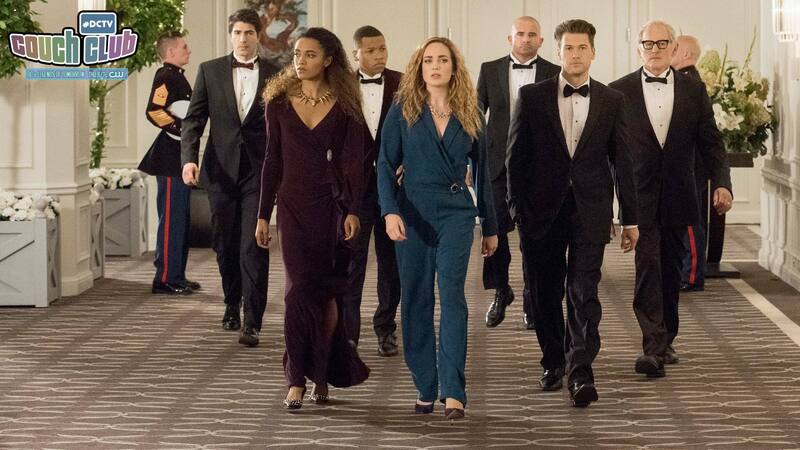 DC'S Legends of Tomorrow: Whatever Happened to the JSA?